Burger chain plans four more Georgia locations. 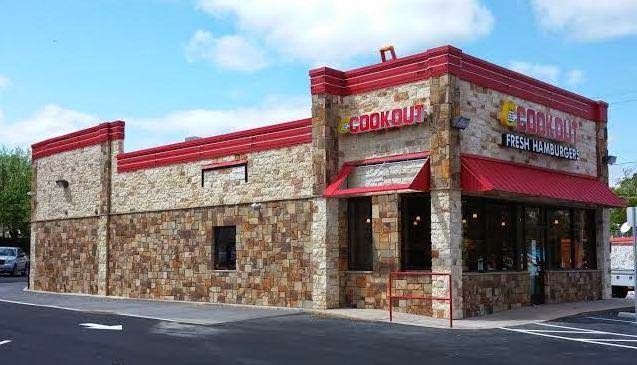 North Carolina-based Cook Out has secured four new locations in Georgia. The new restaurants are coming to Augusta, Dalton, Riverdale and Snellville. In Dalton, Cook Out will open at 1257 Glenwood Avenue. The new burger joint will open in place of a shuttered Shoney's restaurant. The roughly one acre property sits adjacent to an existing Bojangles' and across the street from an existing Captain D's. In Riverdale, Cook Out will open at 6897 GA – 85 on the site of a former car lot. The new restaurant will open adjacent to an existing Taco Bell, across the street from KFC and kitty corner from a relatively new Burger King. In Snellville, Cook Out will open at 2019 Scenic Highway. I've previously mentioned this location as it will share its property with a new Taco Bell. Previous plans called for Pollo Tropical and Krispy Kremes on the property but those plans fell apart. Pollo Tropical has since opened in a converted Cabana Grill nearby. The subject property was previously a large BB&T Bank branch. In south Augusta, Cook Out will open at 3012 Peach Orchard Road on the site of a one time Golden Corral that was most recently an Asian buffet. The new Cook Out will be the chain's fourth in Augusta. Cook Out entered the Augusta market in 2013 with a location at 1801 Walton Way. Subsequent locations opened at 4088 Jimmie Dyess Park­way near Fort Gordon, and 2910 Washington Road. Sources say the Dalton and Riverdale restaurants should open by mid-to-late May. Planned openings of the Augusta and Snellville locations are still being finalized. These four new locations will create a total of twenty-seven locations in Georgia for the growing chain. Do you think Cook Out lives up to the hype? What is your favorite menu item at Cook Out? Where would you like to see Cook Out open next? I wish they would open one in East Cobb. Maybe in the old McDonald's near the big chicken. That would be great. It absolutely does not live up to the hype. My gf just raved about them when we went through North Carolina, and even there, it didn't blow me away at all. The burgers are bland, no flavor really. I will say the shakes are good, but that's about it. We DO wanna wanna know when a Bojangles will appear inside the perimeter, specifically in the West Midtown area. Now THAT is something to get excited about! As I’ve mentioned in earlier posts I was somewhat disappointed on my visits. The food is decent, prices more than reasonable and the service was good, but really just a very nice fast food experiences. Now, maybe that’s all it was ever supposed to be, but some of the previous reviews made it sound like they had reinvented the hamburger or something. Now, having said all of that, I still think they’ll continue to do well because they are significantly better than McDonald’s or Burger King. Opening in Sandy Springs would be great. Maybe in the still deserted burned out Wendy's on Roswell Rd. just past Northridge. They are better than the national chains, but need to work on condiments. Would be nice to have ketchup pumps and a decent BBQ sauce to go with their pulled pork. Their big feature is value...similar product to 5 Guys at half the price. The Alpharetta location pretty much put the overpriced adjacent Varsity out of business. They are not what they used to be (quality wise) when they started in North Carolina. As long as they open where similar type chains have not saturated the market they should do fine. Maybe my tastes have refined a bit since college in NC but I am just not excited they are are coming to my area of the metro. I hope they do well but they have some competition with Freddie's and Culvers (I believe) entering the market as well. IMO fast food chains are nothing to get excited about. Certainly on par The Varsity -- lots of greasy fast-food for not a lot of money. I also think one would crush anywhere in East Cobb, heck prolly two or three -- provided the store could get enough trained staff. That is always the nit in these concepts. YOU CAN GET A QUESADILLA AS A SIDE DISH! $.99 BLT's, Chicken nuggets and Char grill hot dogs. Good food...cheap! The quality isn't what it was once. It's weird because the ones in Charleston and Augusta tasted way better than the ones here. Maybe they use a different food vendor or something. I will say they hype is a bit overboard, but let's be honest... It's cheap and char grilled! The infamous $4.99 COOKOUT TRAY crushes all of the new $4 combo deals at other fast food places. The value is definitely the Chick-fil-a level of customer service, but with red meat. And you can get chicken nuggets as one of TWO side dishes! I mean, c'mon. Can we PLEASE get one in Conyers or Covington.